Average feline heart and lungs infested with a single heart worm. 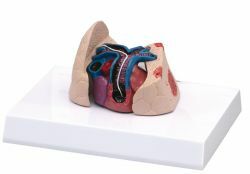 Cutaway view demonstrates structures in the heart (right ventricle, pulmonary trunk, pulmonary arteries and lungs) where adultstage heartworms are normally found. The cut section of thee lung indicates patches of heartworm-induced irritation.